Daly was born in Santa Monica, California, the son of Coachella Valley TV personality Pattie Daly Caruso, and car salesman Jim (a.k.a. J.D.) Daly. His mother is from Fayetteville, North Carolina. His father died from bladder cancer when Carson was a boy. Daly attended Santa Monica High School and was a member of the school's golf team before graduating in 1991. He attended Loyola Marymount University in Los Angeles and dropped out to pursue a pro golf career. He is of Irish descent and has worked with Guinness on local "Proposition 3-17" to make Saint Patrick's Day an official holiday. Daly served as an intern to Jimmy Kimmel in radio at the age of 18 in Palm Springs, California. He began his entertainment career at College of the Desert and found his voice with an internship at the former KCMJ FM (now KKUU) under the name "Kid Carson". Daly began his broadcasting career at the radio station KOME in San Jose, California. Daly was then given the 6-10 PM time slot at KOME's sister station KROQ in Los Angeles. It was during Daly's time at KROQ that MTV recruited Daly to serve as a VJ during MTV's summer beach house programming called "Motel California." At the end of the summer, MTV hired Daly as a permanent VJ, a position which required Daly to relocate to New York. Once in New York, Daly began hosting MTV Live. Daly hosted MTV'S TRL from 1998-2003. TRL was born out of two shows, "Total Request" and "MTV Live" both hosted by Daly. Daly's role as host of the popular live program included introducing the top 10 videos of the day and interviewing celebrity guests. In 2002, Last Call with Carson Daly debuted. The show was shot on the same set as Saturday Night Live until 2005 when it moved to Los Angeles. Beginning in 2003-04, Daly began hosting a New Year's Eve special for NBC, New Year's Eve with Carson Daly. In 2011, Daly began hosting and executive-producing NBC's reality music competition The Voice. Daly's duties as host include watching blind auditions alongside contestant's family members. As a producer of The Voice, Daly has won four Emmy Awards for Outstanding Reality-Competition Program, first in 2013 and again from 2015, 2016, and 2017. When social media correspondent Christina Millian departed the show, Daly became the sole host. Carson Daly appears in a brief but pivotal role in the first episode of My Name Is Earl. While in the hospital after being hit by a car, Earl learns about karma from watching an episode of Last Call with Carson Daly where Daly claims that his success is a direct result of doing good things for other people. Earl is thus inspired by Carson Daly to turn his own life around, and sets out to make up for his many past wrongs. Carson Daly also had a small role on Dave Chappelle's show Chappelle's Show. In September 2013, Daly became the orange room anchor (social media reporter) on the Today show and also serves as a fill-in anchor for Willie Geist and the show's weekend edition (Weekend Today). Daly is a founding partner with Jonathan Rifkind, Jonathan B. Davis and Bam Margera of an independent record label, 456 Enterprise & Entertainment, which released the "Viva La Bands" compilations. In March 2000, Tara Reid met Daly on the set of Total Request Live, and they began dating. They shared an apartment in New York City and Daly proposed on October 29. In June 2001, Reid and Daly broke off their engagement. Daly became engaged to Siri Pinter, a food blogger, in 2013. Her father is actor Mark Pinter. The couple married on December 23, 2015, in a small ceremony. They have three children: a son, Jackson James Daly, born March 2009, and daughters Etta Jones Daly, born in September 2012, and London Rose Daly, born on August 20, 2014. Daly has opened up about his struggle with generalized anxiety disorder. 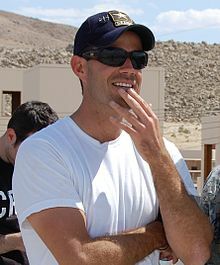 ^ a b c "Carson Daly Biography: Television Host (1973–)". Biography.com (FYI / A&E Networks). Retrieved December 28, 2015. ^ "Carson Daly - MTV VJs Then and now". thefw.com. ^ "Carson Daly Returns To Radio". Billboard.biz. Retrieved 22 January 2014. ^ "The Daly Download With Carson Daly Hits the 100 Affiliate Mark". WestwoodOne.com. Retrieved 25 April 2015. ^ "The Buzz Monday". The Riverside Press-Enterprise. November 27, 2006. Archived from the original on February 9, 2010. ^ Carson Daly[permanent dead link] Filmreference.com (April 2010). ^ a b Stump, Scott (November 14, 2013). "Carson Daly #InspiredBy his mother, a breast cancer survivor". Today.com. Retrieved February 8, 2017. ^ a b "Late Night with Conan O'Brien Interview". Late Night with Conan O'Brien. March 12, 2008. ^ Kissell, Rick (18 September 2014). "Q&A: Carson Daly on Casey Kasem, 'The Voice' and 'TRL'". Variety. Retrieved 13 July 2015. ^ For COD, Step Up. "College of the Desert Foundation". stepupforcod.com. Retrieved 28 June 2018. ^ a b c d e Jackman, Ian (2000). Total Request Live: The Ultimate Fan Guide. Simon & Schuster. p. 45. ISBN 0743418506. Retrieved 25 September 2015. ^ "Carson Daly Looks Back as TRL Counts Down its Final Days". TVGuide.com. 2008-11-14. Retrieved 2017-01-07. ^ a b Anderson, Kyle (14 September 2014). "On the 15th anniversary of the 'TRL' premiere, a look back at the first top 10". Entertainment Weekly. Retrieved 13 July 2015. ^ Fienberg, Daniel (December 31, 2004). "Carson Daly stakes his claim on New Year's Eve". Pittsburgh Post-Gazette. Zap2it.com. Retrieved 5 January 2013. ^ Weber, Lindsey; Frank, Sarah. "Meet The Voice's Seven Most Apoplectically Happy Families". Vulture.com. Retrieved 25 September 2015. ^ "The Voice". Emmys.com. Retrieved 25 September 2015. ^ "Carson Daly | Television Academy". Television Academy. Retrieved September 21, 2017. ^ Lee, Ashley (February 24, 2014). "'The Voice': Usher Talks Cee Lo's Departure, a 'Feistier' Shakira". Billboard. Retrieved September 21, 2017. ^ "Carson Daly Sees Fireworks". TVGuide.com. 2007. Archived from the original on March 15, 2008. Retrieved February 8, 2017. ^ a b Grossberg, Josh (October 31, 2000). "Sorry, Girls: Carson Daly, Tara Reid Engaged!". E! News. Retrieved June 14, 2014. ^ "Carson Daly and Tara Reid Confirm Split". ABC News. July 3, 2001. Retrieved June 14, 2014. ^ a b Leon, Anya (2012-09-06). "Carson Daly Welcomes Daughter Etta Jones". People. Retrieved 2012-09-06. ^ a b Jordan, Julie; Lindsay, Kimble (December 24, 2015). "Carson Daly is Married! Host Weds Longtime Love Siri Pinter". People. Retrieved December 27, 2015. ^ Garcia, Jennifer (March 16, 2009). "It's a Boy for Carson Daly & Girlfriend!". People. Retrieved December 28, 2015. ^ Murray, Matt. "It's a girl! Carson Daly welcomes new baby London Rose Daly". Today. Retrieved April 25, 2015. ^ Riley, Jenelle (July 11, 2013). "Carson Daly On Hosting, Fame, and Not Being a 'Tool'". Backstage. Retrieved April 25, 2015. ^ "Carson Daly does this 1 thing when he feels". TODAY.